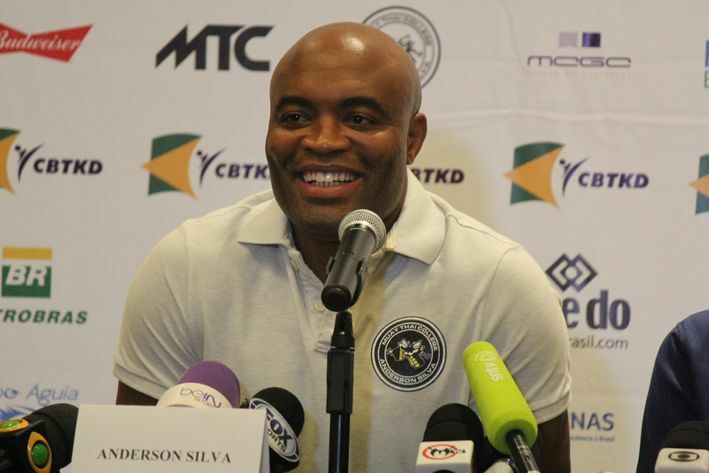 Brazil - 2015/04/30 - Anderson Silva is temporarily suspended from mixed martial arts (MMA) after failing multiple drug tests for steroids in the wake of his comeback fight against Nick Diaz at UFC 183 earlier this year. If Nevada State Athletic Commission (NSAC) decides to suspend “The Spider” for an extended period of time at his upcoming disciplinary hearing, his Olympic dreams could vanish. That’s because Brazilian Agency of Doping Control (BADC) secretary, Marco Aurelio Klein, recently informed Globo Esporte (via MMA Fighting) that whatever punishment NSAC levies against Silva could affect his chances of competing in the 2016 Olympic games in Rio de Janeiro, Brazil, in the sport of Taekwondo. Silva is already prepared to live with any ruling NSAC and BADC make about his combat sports future. Furthermore, Klein says that just like in MMA, Silva will be subject to random drug tests during the Taekwondo tournaments. After this revelation, Silva’s legal team has to ensure that it brings its “A” game to “Sin City” when the commissioners call. Not only to prolong his MMA career, but to not squash his Olympic dreams, even if its considered a “joke” to some of his countrymen.